I've seen photos created using a DIY camera trick and couldn't resist testing it myself. Bokeh is the term for the out-of-focus areas in a photo, particularly those little highlights created when photographing small points of light. Usually those highlights are circles or polygons, but it's lots of fun to make your own shapes. You'll need a DSLR camera and a lens with a large aperture. I'm definitely no photography expert, so refer to this good article for info about lenses and settings for taking shots with bokeh. I used my Canon Digital Rebel XSi with a Canon 50mm f/1.8 lens (this is my only extra lens; it's relatively cheap, lens-wise, and I love it). You'll also need a piece of black paper, pencil, scissors, tape, and a craft knife or decorative paper punch. Cut a strip of paper long enough to wrap around your lens. I made mine 10" x 1.5". I put a strip of tape along the entire length of one edge so it would be easy to peel pieces of tape off this smooth area, just in case I wanted to switch my shape cutouts later. Wrap the paper strip around the outside of your camera lens to form a cylinder and secure it with tape. Then set this paper tube on a piece of black paper and trace around it. Cut out the circle. This will be the cap on the paper tube that fits over your lens. 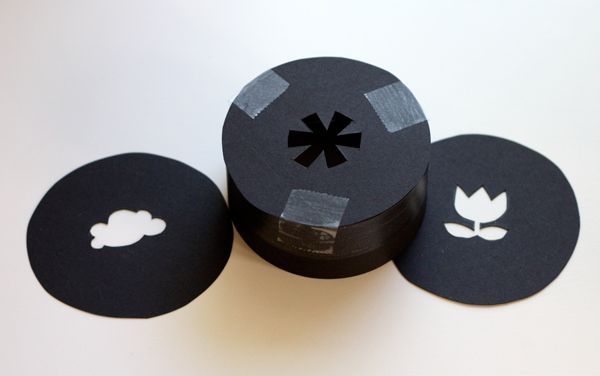 Use a paper punch or Xacto knife to cut a hole in the middle of the circle. Make the shape somewhere between 1/2" and 3/4". 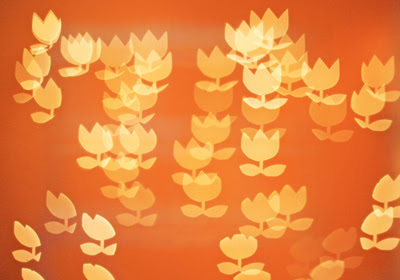 I used a knife to cut a cloud, asterisk, and tulip. 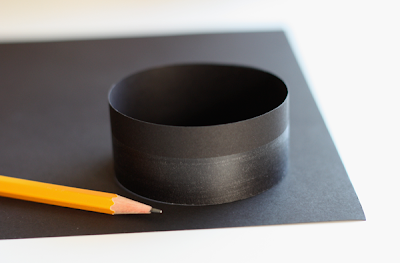 Tape the paper circle to the tube to form a cap that will fit neatly over your lens. 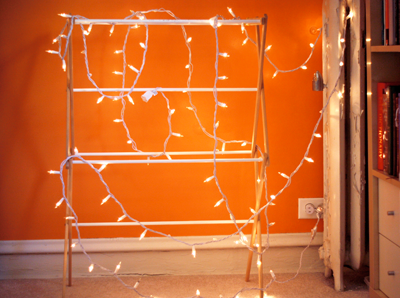 To test this little project, I needed some tiny points of light, so I threw some Christmas lights on a clothes rack (in daylight, but nighttime shots are cool, too). Then I fitted my paper cap over the lens and made sure my aperture was open as far as it would go. Putting an object in the foreground is fun, too. I totally amused myself and recommend you try this. i've been trying to do this for a year or so but never got it right.. your instructions are so clear!! i'm jure i'm gonna nail it this time.. thanks so much!!! You can do it! The key is focusing on a spot near your lens so the background will be blurred. Having your aperture open pretty far will create a shallow depth of field so all those background lights will be out of focus. I played around with the same thing this last Christmas & cut out so many shapes! It's a lot of fun. I CANNOT FIGURE THIS OUT!!!!!!! HOW FRUSTRATING!!!!!!! NIki, which part in particular? Making the paper thing, or taking the photo? Super cool. Love the bovine. Ohh this sounds so fun! I can't wait to try it after final's are up! I love this! I've seen it done before, but never explained so well or with such COOL shapes! 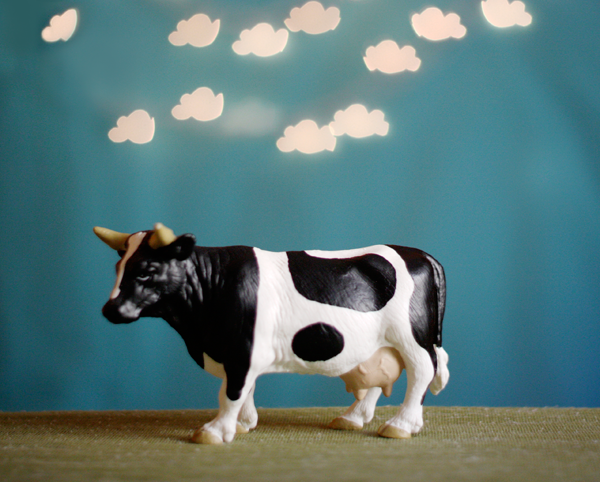 I love the cow with the clouds! Too cute! I'll have to try it! Fantastic tutorial Jess! I've seen these around but didn't realize that it was quite easy to do -- thanks so much for the tutorial! wow, useful and fun...thank you so much!! Uau, perfect idea, i will try it, defenitely. This is soo cool, I didn't know you could do that with any shape. I love the cow and the cloud picture. I have to give it a try some day. Thank you for sharing this great tutorial! this is so awesome! i recently got a DSLR and this seems so fun! How neat! I will have to try this. Thank you! THANK YOU! I've seen this before, but only in super-informative scientific la la la articles. My attention span isn't much longer than a tutorial. So, thanks for making it easier! I can't wait to try this! ...and your cow made me smile. Thanks. :) The cow uses white Christmas lights draped in front of a bed sheet. I love. The cow. So much. Great compositions! I love the cow :) We wrote about bokeh in PolkaDot Lighthouse some weeks ago and I really liked the result, so simple and great results! I wanted to tried out this and your instructions seem very good. I'll experiment as soon as possible :) Thank you very much! This is so cool! Thanks for the great tutorial! I want to be youuuu!!! I'm w everybody - I need the cow scene in my office - full size - pronto. Jess, do you think I should ask Pa to send Rachel a cow? Hmm, Mum, she did request full size... the shipping cost might be prohibitive, though. Not to mention feeding it. Recognize the ground in that photo? I took off my green hoodie and threw it over the TV tray. I practically live in that sweatshirt. No, I thought it was a real pasture! Prohibitive also: hauling the you-know-what. this is hella cool. will def try. I've been meaning to try this technique with different shapes for such a long time! Thanks for re-inspiring me! I've done this with hearts on street lights. But now that I think about it, it would be a cute night wedding photo or valentines day photo or some other lovey moment. I think I'm going to have to buy a DSLR camera, just to try this! Amazing effect - thanks for sharing! Haha. That is awesome! Yours looks so neat!! When I made mine, the edges were all lumpy and gross. Haha. Just tried this the other night, thank you thank you for the tutorial!! It took me a few tries but I finally got it! Keep up the great work :). Thank you ! it works very good ! I tried out immediately with some candles and a swan silhouette. this is so good, but i cant do it! i keep trying but it just doesnt work for me. i made a heart shaped one and when i took the photo it didnt come out like yours, but instead you could just see the photo inside a heart surrounded by black :/ help please! I've managed to make the paper bit but when i try and take the photo all i get is a small circle in the middle of the photo with a black background, so frustrating! 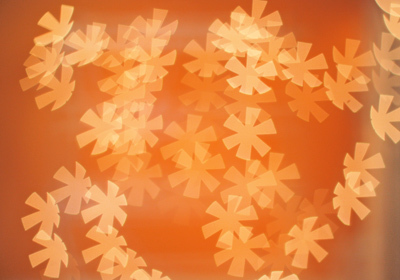 If you want to lasercut your bokeh filters, here's a tutorial on how to do it ... even if you don't own a laser cutter! Enjoy! Yes, paying Ponoko or another company to cut something for you is always an option if you don't mind that it costs a bit. Mine was on auto; I focused on my finger and then moved my finger away before pushing the button all the way to take the picture. I'm sure there are a few ways to do it, though. U can use a Prime Lens of 18mm .